Congratulations to Brian, who once again, proved his Person-of-Mystery prowess by successfully identifying Charles Boles, better known as the notorious stagecoach robber "Black Bart." I'm not the kind of guy to typically root for the outlaw. I know there are not too many real-life Robin Hood types, only stealing from the richest of the rich and fewer still who can pull it off with style and good humor, but I suppose Charles Boles may come closest. Boles, born in England and brought to America at two years of age, was raised on a farm in Upstate New York. In 1849, Charley and two brothers came to California to work the gold fields, but returned after a somewhat unsuccessful year. In 1854, he married a Mary Johnson, had several children, and farmed near Decatur, Illinois. During the Civil War, Boles enlisted with the 116th Illinois Infantry, was promoted to First Sergeant and even breveted a First Lieutenant. The quiet life held little appeal to Boles and after the war, he was back in the mining camps of Idaho and Montana and writing home to his wife. In an 1871 letter, he mentioned how upset he was with some employees of the Wells Fargo Company. Then the letters stopped and his wife assumed he had died. 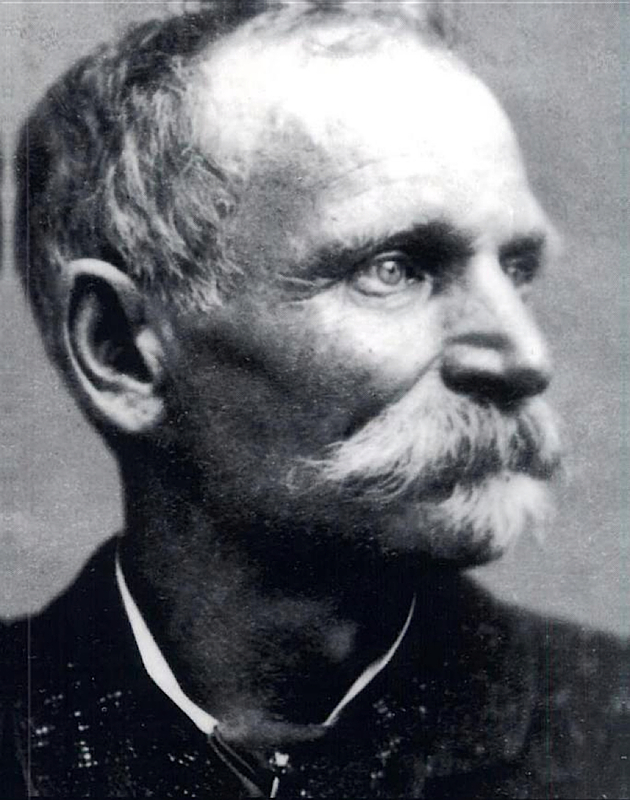 On July 26, 1875, Boles pulled off his first of 28 stagecoach robberies in Calaveras County, California. Boles was dressed in a long coat and armed with a shotgun. A flour sack with cut eye holes covered his head and he wore his bowler hat over the flower sack. What made him different was his courteous manners during each of his robberies. He would issue his demands with pleasantries and without profanity. "Please throw down the box," he would request. Boles was scared of horses, so he was always on foot and in several of the robberies he would pretend as though there were accomplices hiding in the surrounding brush to support him. You fine-haired sons of b*****s.
Boles only left those two notes, in which each line was written in a different handwriting style and the first poem containing the only known profanity (perhaps to throw detectives off) but it was enough to cement Boles reputation as "Black Bart." During his life of crime, Boles never fired a shot, and he was always mannerly with both stage drivers and passengers. 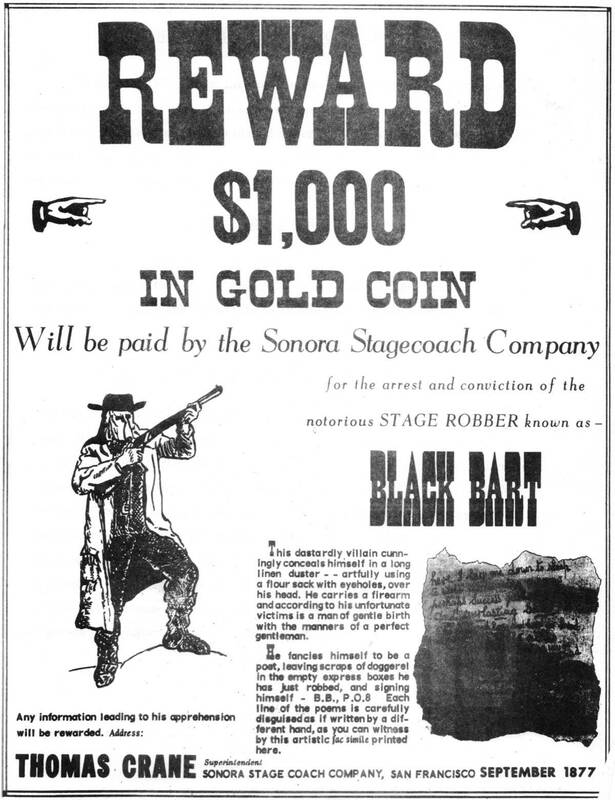 At one robbery, without being asked, a terrified woman tossed her purse at "Black Bart." He immediately returned it, tipped his derby, and said, "Thank you, madam, I do not wish your money. In that respect I honor only the good office of Wells Fargo." After making off with thousands of dollars, Boles luck finally came to an end on November 3, 1883. Boles stopped the stage as usual, but found the strong box bolted to the floor of the passenger compartment, taking him longer to remove the box. Also unknown to the bandit, one of the passengers left a the stage a short while before to shoot some game and upon returning and finding the stage being plundered, fired several shots at Boles, and hitting him once in the hand. The slightly wounded Boles fled the scene, but in his haste he left some personal affects including field glasses, a razor and belt, three shirt cuffs, and a handkerchief with the laundry mark, "F.X.O.7." 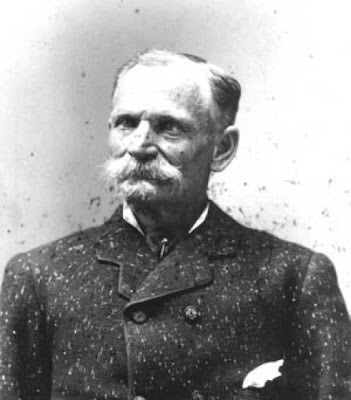 A Wells Fargo Detective, James B. Hume, who ironically looked much like Boles, was placed on the case and one of his agents, Harry Morse, traced the laundry mark to Biggs California Laundry on Stevenson Street in San Francisco where Morse was informed that it belonged to a Charles Bolton, renting Room 40 at the Webb House, 37 Second Street. 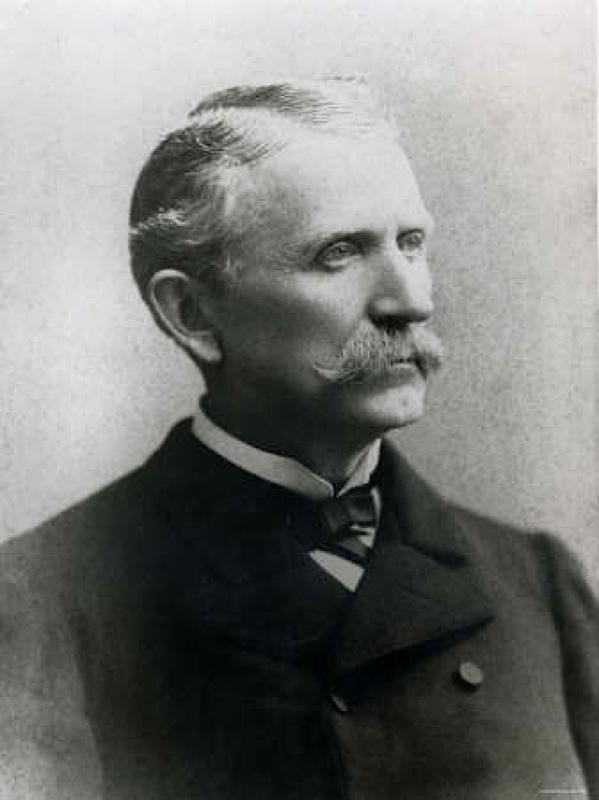 Hume confirmed that Bolton had been away on business at the time of each of the robberies and had him arrested. A search of Bolton's room revealed an identical handkerchief to the one recovered at the robbery and a Bible bearing his real name in the flyleaf, "Charles E. Boles." Hume's report described Bolton as "A person of great endurance. Exhibited genuine wit under the most trying circumstances. Extremely proper and polite in behavior, eschews profanity." At first, Boles denied he was the individual, but after intensive questioning, the 5' 8" 54 year old with blue eyes confessed to the single robbery in which he was wounded. He waived his right to a jury trial and was given six years at San Quentin State Penitentiary. With good behavior, Boles was out in a little more than four years. Reporters at his release, asked him if he was going to go back to robbery. "No, gentlemen, I'm through with crime," was Boles' reply. Another reporter asked him if he would write more poetry. Boles laughed and said, "Now didn't you hear me say that I'm through with crime?" Boles never returned home to his wife who was now living in Hannibal, Missouri, but wrote to her and complained of being constantly followed by Wells Fargo Agents. The last time he was seen was at the Palace Hotel in Visalia, California, on February 28, 1888. He checked in, but then disappeared forever.